1. I've been in the mood to organize lately. which has been encouraging me to organize my personal spaces. my linen closet, the junk drawer in my kitchen, my basement bookcases, etc. It feels great to declutter, purge and reorganize my things! If you'd like to see what I've done so far, I've been posting my progress on Instagram. 2. My purging has also carried over to my stamping supplies. I've added to my "for sale" list here, if you're interested in checking it out. I have stamps and dies from Papertrey Ink, Wplus9, Altenew, Sweet 'n Sassy, Winnie & Walter, etc. 3. We've been pretty busy lately... or at least my kids have been! all of the songs they've learned this year. Jonah sang a solo in Man in the Mirror -- that's him in the front row -- he did such a great job! Trixie the Teen Detective and the Mystery of Gravestead Manor. He played Professor Harlow Biedermeier, an archeologist. sacred vocal, where she sang His Eye is on the Sparrow. She was asked to perform at the Festival Highlights program, where she sang Chase the Wind, from Brave. Jonah and I were also asked to play at Festival. 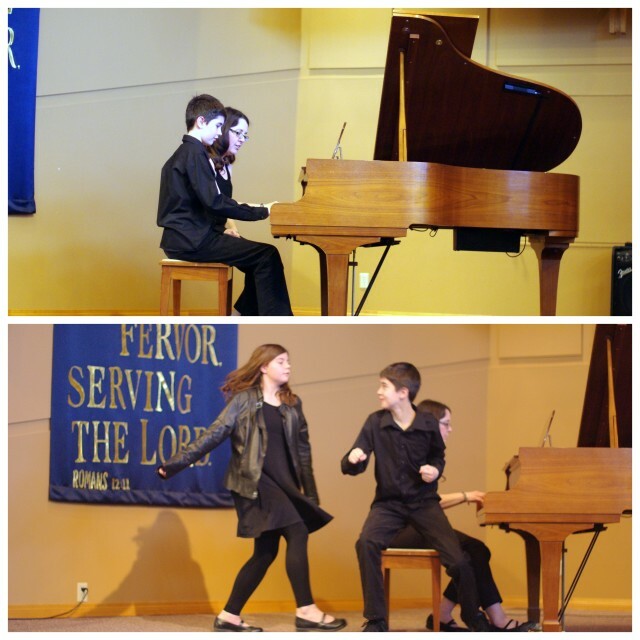 He fought her off and then returned to our duet, with perfect timing, of course. I'm testing for my 3rd degree black belt in taekwondo. I feel I'm ready, but I'm nervous, too! 5. I have a card for this week's Make It Monday at Papertrey Ink: Ink Blending Through Diecut Masks. I created my mask using the large flower die from Bloomers. I used it twice with Altenew Lavender Fields ink and PTI Aqua Mist. and added Spring Moss ink to my card. I stamped the centres in versamark and heat embossed them in gold. Then, I diecut three Bloomers flowers from vellum and heat embossed the centres as well. I rubbed the edges of the largest one in versamark and heat embossed the edges in gold. I stamped the sentiment (from Songbirds) in aqua mist. Love seeing what your family is up to. Such wonderful times together! Good luck with your testing tomorrow. I have no doubt you will be awesome! Pretty color combination with all that gold! The vellum is a gorgeous addition! So nice seeing the photos of the kids Leigh!! GOOD luck tomorrow!! Pretty card today, love the gold!! such a pretty card. good luck tomorrow! What a talented family you all are, Leigh. It's so much fun to see your kids (or grandkids in my case) share their talent with the world. And for you to participate with them must be amazing. Your card is wonderful. I love that you added the cuts from the vellum back on the card. So glad I came by to tell you how much I love your card design. What a treat to see what you've all been up to. Your kids must be so talented. And funny to hear that you're organizing. I just spent five hours on iheartorganizing's blog last night. Getting motivated. Now I just gotta do it! Yay for you. You do should like one busy and talented family! You must be so proud! Your card is gorgeous trimmed in gold Leigh! Congratulations on all your family's successful moments, and good luck for you tomorrow! This card is beautiful, love the vellum flowers and gold embossing along with the blended ones. Talented kids, congrats to you Proud mama! I love your take on MIM this week, such a pretty card, especially the addition of vellum. Love the gold embossing and the vellum it really adds some wow to your card! Wow your family is a busy one! Enjoy..... the time goes by TOO quickly!!! Your card is so pretty...love that vellum and bits of gold! Thanks for all of the fun updates and for including some pics of Jonah :) Love how talented your entire family is! And your MIM card is fabulous and beautifully done. Such a talented family! Hope your test went well, Leigh--bet you nailed it! Beautiful use of the MIM technique! Great card!! Love the gold touches and pretty colors! I love your updates. LOVE the photos!! That MIM card is STUNNING!!! Love your Friday Five posts! You guys are all SO talented! Good luck on your testing, Leigh, and congrats to the kids on all their accomplishments! Your card is gorgeous, too. So, so elegant with the vellum and embossing, and love all the overlapping elements! I look forward to your Friday fives! Being a musician myself it's fun to see your family's escapades! Your MIM card is gorgeous with all the gold, vellum and yummy colors! Gorgeous card Leigh! It's so elegant and pretty & I love the gold embossing & vellum flower.